Great gig & venue . The band were & are awesome. What fantastic performance ! The energy, stage sets and musicianship were incredible. Loved the show and will definitely see this band again. "One of the best live bands around"
These guys are so interactive with the audience and the quality of their music is fantastic! Great band, great guys and great venue too. If you appreciate real music and great fun then these guys are for you. Can't wait to see them again. Pure entertainment! VT never fail to give everybody a great time. Their music and passion is beyond amazing, and along with their energy on stage and off stage when Ty making his way through the crowd either on foot or swimming overhead make VT the best live band I've ever seen. LA R&B band Vintage Trouble are drummer Richard Danielson, guitarist Nalle Colt, singer Ty Taylor and Rick Barrio Dill on bass. See them take over iconic Sheffield venue Plug on Monday 13th of August 2018. 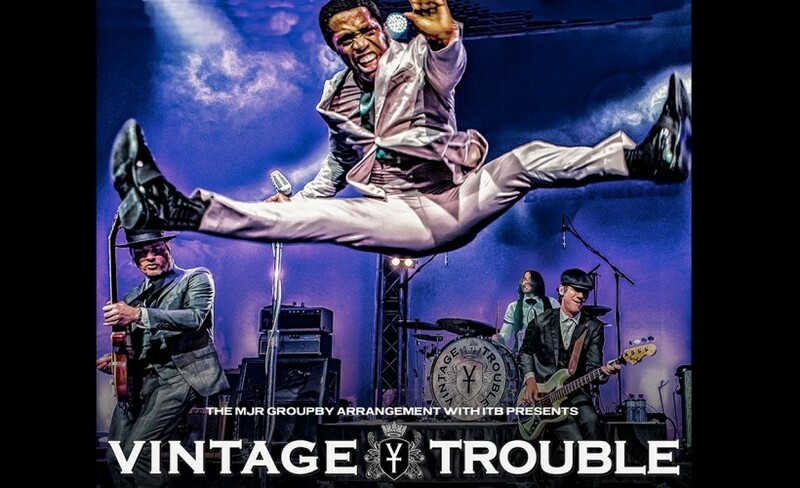 Now is your chance to book your Vintage Trouble tickets with Gigantic, we are very excited and as demand grows it makes sense to act fast and get yours before they are all taken. Gigantic makes selecting your favourite tickets and placing your order easy by enabling access to our site 24/7 using your smartphone, tablet or computer whilst relaxing at home or even busy and on the go. Set a personal reminder with Gigantic so you can be alerted with a text message or an email just prior to their release at 10:00 on Wednesday 14th of March. Since the release of their debut album, ‘The Bomb Shelter Sessions’, Los Angeles-based band Vintage Trouble has gone from playing intimate hometown clubs to opening for The Rolling Stones in London’s Hyde Park, touring North America and Europe with The Who and playing sold-out headline shows worldwide. They’ve also made waves with break-through performances on Late Show with David Letterman, The Tonight Show with Jay Leno (four times, including Leno’s second-to-last show), Conan, Jimmy Kimmel Live and Later…with Jools Holland. Lovingly described as “James Brown singing lead for Led Zeppelin” the band play a selection of UK dates, in between and arena tour with Paloma Faith. Their subsequent records include The Swing House Acoustic Sessions and their latest release 1 Hopeful Rd. We are really excited to be able to offer you Vintage Trouble concert tickets, but as we only have limited supplies you really will have to act fast and book before they are all snatched up. Gigantic has a well-earned reputation for being the best place to choose from a wide range of essential gig tickets and providing excellent customer service, and so we have been bestowed the Nottingham Post illustrious ‘Retail Business of the Year 2017’. So, you know we are the right place to come whenever you are booking your big night out. Marvel Universe LIVE!, Elton John, Muse and much more!